And so, as the holidays approach, so does the yearly debauchery known as Santacon. In the 5 years I have lived in the city I have done it two times so far. First year, I didnt know about it. 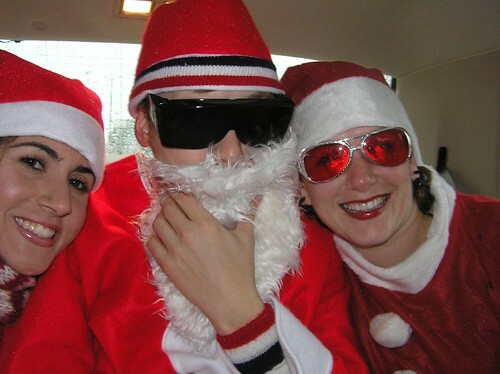 Second year, was my first year in my house…and I got initiated into Santacon. Third year participated as well. Last year I went to NY for the holidays on the same weekend as the madness, so I missed it. This year however…I will be here. Its Saturday. Klassic Kringle—Santa hits Fisherman’s Wharf and other favorite hotspots (that will still have us). Suggested props: Signs (Elfcare for Everyone, Santas Demand More milk & Cookies, etc.) Celebrate Santa’s many corporate friends & partners by displaying your favorite sponsor on your suit. Ho on Haight—Suggested props: “Ho on Haight” or “Ho on H8″ signs (think “No on 8”), drums, noise makers. Santa also asks that you bring presents for the poor unfortunate “homeless” children. Mastrobation—The Mission and Castro are getting Married…Gay Married! Suggested props: It’s all about choice, so it’s up to you how you’d like to participate (assorted props and gifts are always appreciated).